That is one fabulous shot!!! GMV! Tom, this is outstanding; absolutely superb! What a fantastic shot....perfect timing, perfect exposure. Simply superb! I'd like to see a large file of it! What a great timing , Tom! Love the splash water and reflection! An awesome capture by the two of you. Perfect action and flight capture. Wonderful. So shapr and clear, and the full reflection. Calendar quality!! Wow! Superb timing and amazing double image of this majestic bird! Amazing capture, Tom. This is a classic. Wonderful shot with a great reflection! Outstanding Tom!! Such a great action shot and a cool reflection also!! That bird is really stretched out here. Very nice, Tom! 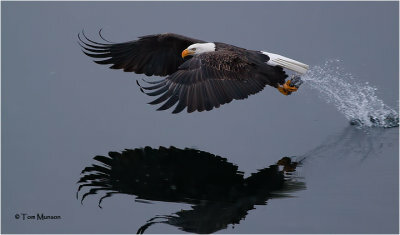 Love the wing position, the action, the reflection !!! fabulous with the reflection and capture of the water and fish,wow. That's one killer shot Tom...BIG CONGRATS. Fantastic capture Tom. Really well done. Voted! Art more than science. Wonderful image. Spectacular image..love the action, reflection and pose! An amazing action shot, Tom. You caught a great pose with a bonus reflection! WOW! WOW! Tom. I thought you had showed us your best already, but you were holding back. This one is magnificent. The best I've seen. You have a lot of wonderful eagle shots Tom, but this shot is absolutely exceptional. Congratulations. Lead, follow or get the hell out of my way! Great shot.